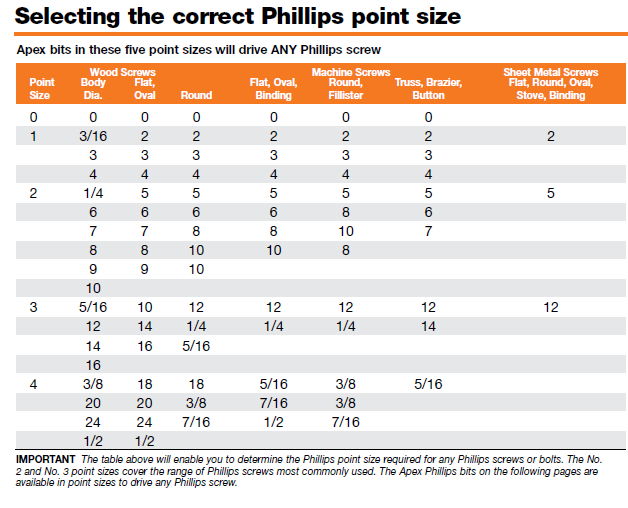 Click here to see how to select the correct Phillips point size. Torx® fasteners are becoming more and more common in automotive and appliance assembly. Apex provides a full selection of bits for Torx screws. Torx Plus® bits and fasteners feature a greater engagement area for higher torque transfer and reduced camout when driving Torx Plus® fasteners. They can provide up to 1 00% more drive cycles. Torx Plus® bits are not compatible with standard Torx® fasteners. The shallow "cross" indention in the screw head identifies a Pozidriv® fastener. The Pozidriv® bit and recess design provides contact than a standard Phillips for more torque with less possibility of camout. Sel-O-Fit® bits are designed to provide a more efficient means of driving Pozidriv® screws. The Sel-O-Fit bit places torque on the strongest and most mechanically advantageous portion of the driver tip. This allows more torque to be applied while minimizing the possibility of breakage and camout. Sel-O-Fit® is a registered trademark of Cooper Industries. The Phillips/square screw drive, also known as the Quadrex or SPAX screw drive, is a combination of the Phillips and Robertson screw drives. While a standard Phillips or Robertson tool can be used, there is a dedicated tool for it that increases the surface area between the tool and the fastener so it can handle more torque. The Frearson recess is designed so that any size bit will fit any size recess. Choose bits on the basis of body diameter - the larger the screw, the larger the body diameter. French recess bits. The name comes from the Bureau de Normalisation de l'Aéronautique et de l'Espace. 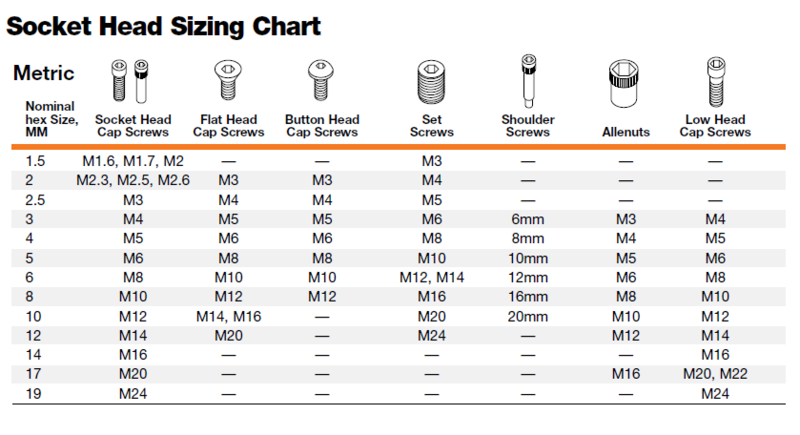 Click here to see how to select the correct SAE Socket Head. 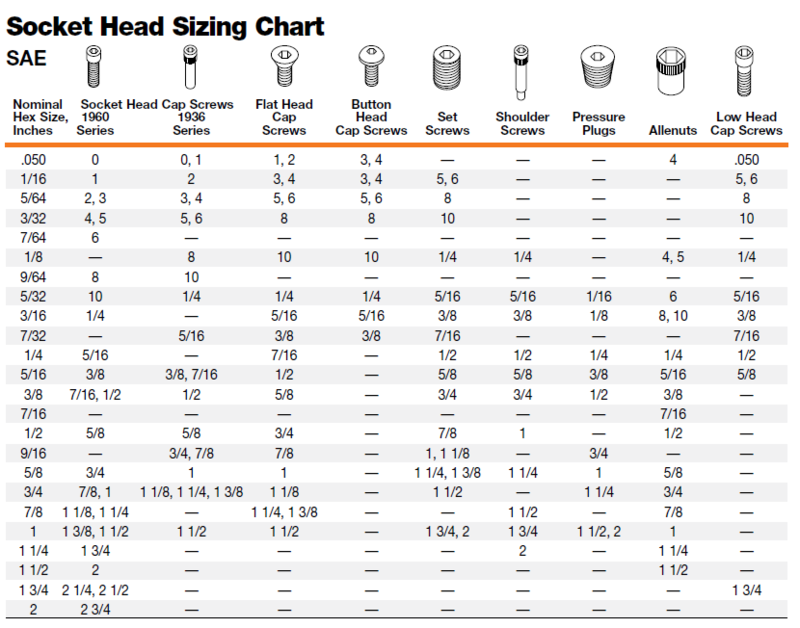 Click here to see how to select the correct Metric Socket Head. A square, also known as a Robertson, screw drive has a square-shaped socket in the screw head and a square protrusion on the tool. Both the tool and the socket have a taper, which makes inserting the tool easier, and also tends to help keep the screw on the tool tip without the user needing to hold it there. For pipe plug inserts use SC and RP bit holders found here. The Mortorq drive, developed by the Phillips Screw Company, is a format used in automotive and aerospace applications. It is designed to be a lightweight, low-profile and high-strength drive, with full contact over the entire recess wing reducing risk of stripping. The tri-wing, also known as triangular slotted, screw drive has three radial slots. It is usually used on electronics equipment. Tri-wing, as the name suggests, is a screw with three "wings" and a small triangular hole in the center. A variation is a kind where the three "wings" are joined in the center (with no triangular hole). The Hi-Torque recess was designed to provide very high installation and removal torques, very shallow recess for use on 120° and 130° flush fasteners in thin skins, and to reduce the need for end-load of the driver by the operator while installing and removing screws. Tool kit includes plastic carrying case with bits.